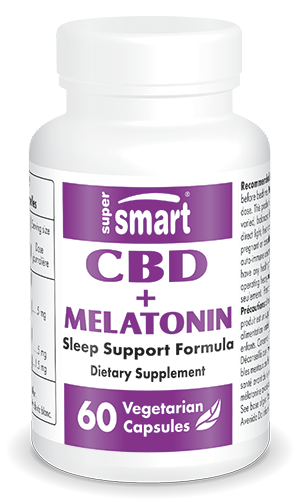 Who is CBD + Melatonin aimed at?? It is suitable for men and women of all ages. It’s particularly good for anyone with an unhealthy lifestyle, or who spends too much time in front of a screen, who works in an office or who has low levels of physical activity. Melatonin is a hormone derived from serotonin, which is secreted by the pineal gland, primarily during the hours of darkness. Often referred to as the ‘sleep hormone’, it is crucial for regulating our circadian rhythms, particularly the sleep/wake cycle. It signals to the body where it is in the day/night cycle and promotes sleepiness at appropriate times. Unfortunately, production of this hormone is nowadays significantly impaired by artificial light. At the end of the day, when the retina senses the decrease in light levels, a neural signal is sent to stimulate production of melatonin and the start of the sleep process. Exposure to artificial light during these key hours thus has a deeply negative effect: melatonin secretion falls dramatically, only to resume later, causing an untimely peak in its production which results in fatigue and sleepiness in the morning (1). This is exacerbated by exposure to the blue light emitted by screens. Melatonin production also declines with age, due to calcification of the pineal gland (2) and decreased melatonin receptor sensitivity. Indeed studies have shown that after the age of 60, the deep and REM (or paradoxical) phases of sleep decline sharply and night-time waking increases. Taking an external source of melatonin before bed is a recognised natural solution to correcting impaired melatonin secretion. Its effects have been demonstrated in people with and without sleep problems (3-4). Unlike drugs, it works without disrupting the different stages of sleep and causes no residual effects the following morning. Various studies show that to obtain maximum efficacy, you need to take melatonin for a minimum of 3-4 days. However, use of this hormone at low doses (as is the case here) should not be prolonged indefinitely, 4 weeks at most, by which time things will be back to normal. Does it produce any side-effects? No particular adverse side-effects have been demonstrated in oral supplementation toxicology studies using a wide range of doses (from 1 to 300mg) over moderate treatment periods (5). CBD does not induce sleep per se, but it helps promote relaxation, vasodilation and pain relief. It is a phytocannabinoid molecule found in hemp (Cannabis sativa) along with the well-known psychotropic substance tetrahydrocannabinol (THC). But unlike THC, CBD has no psychoactive effect – it will not get you ‘high’. CBD is very similar to the endocannabinoid messengers produced by the body to trigger various responses (pain modulation (6-7), reduction in spontaneous locomotion (8-9), relaxation, hypothermia… (10)). Such is its similarity, it is (to varying degrees) able to bind to the same receptors and trigger the same sort of chain reactions. These receptors are primarily found on cell surfaces in the brain, central nervous system and immune system tissues. What are the main elements of the chain reaction triggered? reduction in reactive oxygen species (ROS) and lipid peroxidation (17). It’s an important element of the formulation as lack of sleep is very often linked to stress. The CBD in this formulation is extracted from the leaves of Cannabis sativa, using supercritical carbon dioxide (sCO₂). This is an alternative mode of extraction to the organochlorine solvents normally used in such processes but which are potentially harmful to the environment. Very eco-friendly, sCO₂ both ensures the final product is free from solvent residues and helps maintain the chemical integrity of the heat-sensitive molecules. It is odourless, colourless, non-toxic and non-inflammable and is completely safe for our health and our environment. CBD is very different from THC, the psychoactive substance found in the same plant. It has an excellent safety profile in humans and is in no way associated with the public health problems posed by cannabis. Its half-life is around nine hours, after which it is excreted in urine in a metabolised form. CBD perfectly complements the effects of melatonin: one deals with the hormonal disruption caused by environmental factors, while the other tackles anxiety and stress, which are recognised factors in insomnia. Scientific studies show that melatonin’s mechanism of action is radically different from that of benzodiazepines. Unlike sleeping pills which enforce drowsiness and disrupt cognitive performance and the architecture of sleep, melatonin induces a form of ‘calm sleep’ (18-19). Western populations generally get less sleep than they need to stay on top form (20). Good quality sleep is essential for long-term health, as it has an effect on cognitive faculties, rebuilding damaged cells, neural synapse plasticity, the immune defences, tissue repair, efficacy of endogenous antioxidants, mental health, and maintenance of muscle and bone tissue. CBD and melatonin offer numerous other health benefits, particularly antioxidant, immune-stimulant and anti-inflammatory effects. 1) Try to maintain a healthy lifestyle, particularly by avoiding frequent changes to your sleep habits, smoking, excess alcohol consumption, and using electronic devices in bed (mobile phones, tablets, computers …) Instead, establish a calm routine before you go to sleep - listen to soothing music, read, practise yoga or do breathing exercises, for example. 2) Restrict intense visual, physical auditory or mental stimulation in the two hours before bed. 3) Eat dinner at least two hours before you go to bed, and prioritise foods high in tryptophan, an amino acid involved in the production of melatonin and which encourages drowsiness. Good sources are seeds, wholegrain rice, dairy products, eggs, pulses, chocolate and brewer’s yeast. In addition, light therapy can be valuable, potentially boosting the effects of melatonin, especially in people who spend a lot of time indoors. One capsule taken 30 minutes before bed is generally enough to obtain this supplement’s benefits. It’s worth noting that melatonin receptors are usually more sensitive between the hours of 7pm and 8pm (21). This expertly-dosed formulation is not designed to replace the many plant-based combinations already available (such as the highly-effective Advanced Sleep Formula); it does, however, offer a more powerful alternative if you take into account the impact stress and pain can have on sleep problems. Precautions: Do not exceed the recommended dose. This product should not be used as a substitute for a varied, balanced diet. Keep out of children’s reach. Protect from light, heat and humidity. Not recommended for women who are pregnant or breastfeeding, or for those suffering from mental disorders or auto-immune diseases. Consult a health professional before taking this product if you have any health problems. Do not take melatonin before driving or using machinery. Be careful: We do not deliver CBD + Melatonin in this/those state(s) and countrie(s) : IDAHO (ID), KANSAS (KS), NEBRASKA (NE), SOUTH DAKOTA (SD).